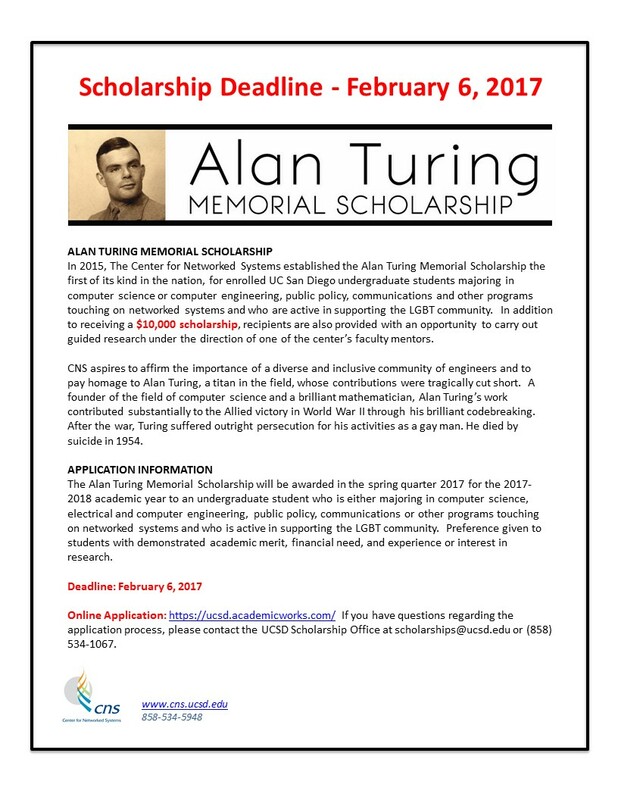 In 2015, the Center for Networked Systems established the Alan Turing Memorial Scholarship the first of its kind in the nation, for enrolled UC San Diego undergraduate students majoring in computer science or computer engineering, public policy, communications and other programs touching on networked systems and who are active in supporting the LGBT community. In addition to receiving a $10,000 scholarship, recipients are also provided with an opportunity to carry out guided research under the direction of one of the center’s faculty mentors. 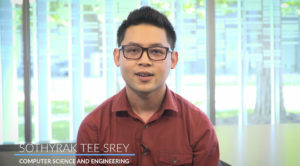 CNS aspires to affirm the importance of a diverse and inclusive community of engineers and to pay homage to Alan Turing, a titan in the field, whose contributions were tragically cut short. A founder of the field of computer science and a brilliant mathematician, Alan Turing’s work contributed substantially to the Allied victory in World War II through his brilliant codebreaking. After the war, Turing suffered outright persecution for his activities as a gay man. He died by suicide in 1954. 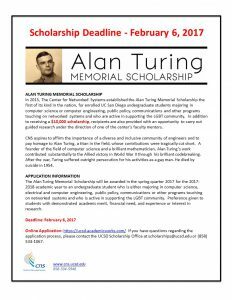 The Alan Turing Memorial Scholarship will be awarded in the spring quarter 2017 for the 2017-2018 academic year to an undergraduate student who is either majoring in computer science, electrical and computer engineering, public policy, communications or other programs touching on networked systems and who is active in supporting the LGBT community. Preference given to students with demonstrated academic merit, financial need, and experience or interest in research.